On December 15, 2009 the Consumer Product Safety Council (CPSC) announced a voluntary recall to repair for all Roman Style Shades with accessible cords on the rear of the shade. This recall also included Roll-up Shades which Springs Window Fashions does not fabricate. This voluntary "recall to repair" is intended to raise awareness about the potential hazards to young children caused by cord loops specific to Roman style and Roll-up Shades. Springs Window Fashions products comply with all applicable industry safety standards and all Roman Shades now ship with a retrofit kit. Springs Window Fashions has been directly involved in the development of the Voluntary Corrective Action Plan and remains proactive in it's approach to product safety. 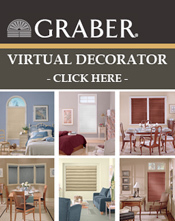 For Graber, window covering safety is a year-round effort! Graber, together with the Window Covering Safety Council, urges parents and caregivers to "play safe, live safe" and install only cordless window coverings in young children's bedrooms and sleeping areas. For a free retrofit kit, contact the Window Coverings Safety Council via the web at www.windowcoverings.org or by phone at 1-800-506-4636. Install only cordless window coverings in young children's bedrooms and sleeping areas. Replace window blinds, corded shades and draperies manufactured before 2001 with today's safer products. Repair window blinds, corded shades and draperies manufactured before 2001 with retrofit cord repair devices or replace them with products made to the current safety standards. Keep all window pull cords and inner lift cords out of the reach of children. Make sure that tasseled pull cords are short and continuous-loop cords are permanently anchored to the floor or wall. Make sure cord stops are properly installed and adjusted to limit movement of inner lift cords. Graber Safety Features Keep Your Family Safe. Cleverly designed system combines two popular options into one — shade lowers from the top or raises from the bottom without the use of exterior cords. Cords are kept at a constant length so they don't puddle on floor when blind or shade is raised and are held taut by a safety hold-down bracket. Eliminates the need for cords and chains to traverse blinds.